In what has to be the day's biggest disappointment, Slang has announced that the plan to include a free luchadore mask with sales of Lucha Libre AAA: Heroes del Ring has been canceled. Here's the deal: Either you know what lucha libre is, or you don't. And if you do, the idea of getting a free mask with your purchase of Lucha Libre AAA: Heroes del Ring is pretty freakin' awesome. I'd probably make a point of putting the thing on and speaking with a crappy Spanish accent every single time I played the game, because I'm just that kind of guy. But it's all just a dream, because Slang, the publisher, has pulled the plug on the giveaway. It turns out that some pencil-neck geeks decided that the masks don't comply with the Consumer Product Safety Improvement Act of 2008. "Rather than post a warning sign on the official AAA mask, we have decided to cancel the mask pre-order gift with purchase because we could not in good conscience distribute them to consumers due to the potential health risk," said Slang CEO Abraham Bautista. Marring the "sacred" masks with a warning label, it seems, was out of the question. So what went wrong? Were the masks haunted by the ghosts of a thousand angry luchadores? Did an eight-year-old girl turn into a rippling wall of muscle who would only respond to "El Diablo Blanco?" Were playgrounds across the country being overrun by youngsters tearing down jungle gyms and threatening to snap other children in half if they weren't given a churro, like, immediatamente? Sadly, none of the above. The masks tested positive for phthalates, which at least one study has linked to a heightened likelihood of autism in children. Not nearly as cool as a heightened likelihood of being slammed through a table, perhaps, but probably more in line with what product safety regulatory bodies test for. Slang said it is "working on securing a new premium item/gift to replace the mask and that will represent the rich tradition of Lucha Libre." 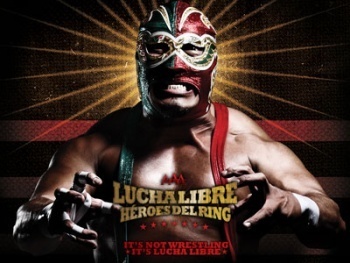 Luche Libre AAA: Heroes del Ring steps into the squared circle on October 12, on the Xbox 360, PlayStation 3, Wii, PSP and Nintendo DS.